I’m so excited about this! After a really long, quiet day at work, I was absolutely exhausted. When I got home, though, I saw a friendly little Knit Picks box on my doorstep. My new knitting toys had arrived! I am beyond thrilled right now. As I mentioned earlier, I got the chart keeper, the wire yarn stranding guide, and the full set of interchangeable needles. 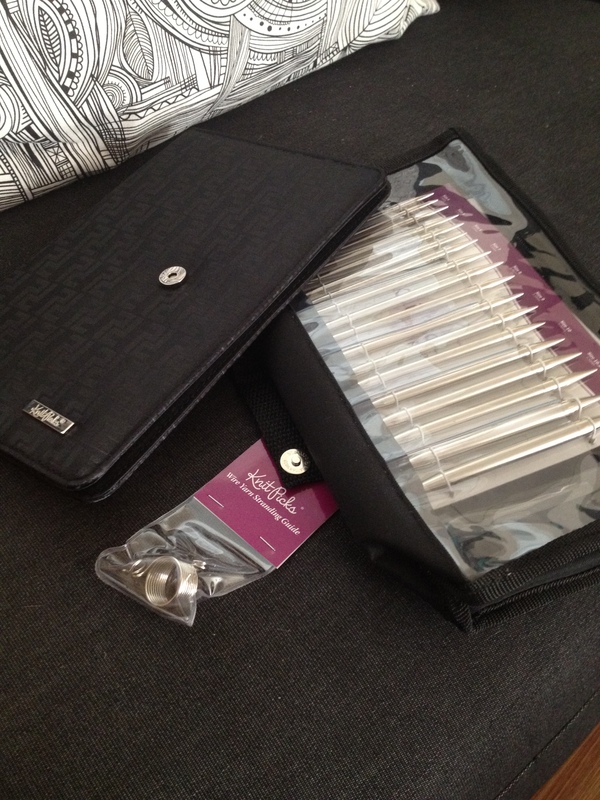 The interchangeable needles comes in a really handy plastic bag with pockets just big enough for each pair. For regular storage, that’ll be just fine. I’m not entirely sure how it would be for traveling, but I suppose when traveling, you already have a project picked out or going. I’m really excited about the chart keeper. I thought the magnets were going to be just strips of thin magnet that would stay in place as long as you were careful. No, these are thin bars of magnets, and I have no doubt that they will stay put. They’re pretty strong and come in a couple different sizes, which will help me keep track of not only what row I’m on, but also where I am in the row if I have to pause before it’s complete. I didn’t feel much up to a lot of knitting last night, but I couldn’t resist a chance to try at least one of my new toys out. I gave the wire yarn stranding guide a go with the test stocking. It was a little awkward at first, getting it to sit just right on my finger, but once I got going, it was all right. I think I’m going to have to practice a lot to get really used to it. I noticed that my stitches were tight, and for colorwork that’s not necessarily a good thing (or for any knitting really). Provided I have the energy, I plan to sit down tonight with the stocking and yarn guide and get some more practice in. I’d like to be better at using it before I get too far into the stockings. Ooooo, I’m jealous! I’ve been looking at those interchangeable sets. Gorgeous! Oooooh, shiny! I have a KP interchangeable set too and love it. Now of course, I want then new Sunstruck ones too, so I’ve been dropping hints for the holidays. You know, hints like “GET ME THESE!” written on a post-it note stuck to a KP catalog left strategically in the bathroom. We’ll see if my tactics work….